Big community can't leave without its members, which are always upset to contact other forum participants privately. This miniBB extension allows to build a private communication dialog between two certain members, the process also known as private mail or private messaging (PM). Well, probably each of Internet user nowadays know, what it means on social websites, just to compose a letter to the person you find interesting. The add-on ads a social meaning to your forums. Besides the standard features which are included in almost every script like this, it also provides unique set of exciting options and procedures which you never meet somewhere else. PM function is available only to registered forum members. In your forums, there will be a special PM icon like this: , it usually appears near each member's username in the messages thread, or under any user's public profile page. Clicking that icon brings a new private message form, where you could type your private comment and send it to the chosen member. In PM folder, all messages are split by Inbox (Incoming), Sent and "Reminding" folders, where "Reminding" means a special folder with the "messages to yourself", and that way may be used to save some forum notes, which you should not forget about. Each messages' folder provides simple and easy-to-navigate interface, where you may quickly recognize unread messages, delete messages, mark them as read/unread, or mark them as important, which puts a special flag near each checked message. Receiving a new message, you will be notified by a special indicating note in the forums menu, so you can check and respond immediately. Reading any message, you can reply instantly, the answering form is provided on the same page and consists of the standard forum form, which your members already may be used to. Screenshot of the Private Contact process - click to view in full size. The core setting of this plugin is that it's designed to work both with mySQL OR flat-files. When choosing mySQL (as it's suggested by default), the server may lose a bit in performance, however it brings more comfortable backup of the forums in whole. Choosing files module allows to keep a a huge part of the resources on the very active server, if there are hundreds of visitors per second. Depending on your forums load, you choose whatever fits best your goal. Limit of the Incoming messages per each user, with the possible exception of this rule for admin and moderators; when it's exceeded, a user won't be allowed to get the new messages from others. That way your users should care about the space on your hosting. Depending on resources, this limit still may have a large value! Anti-spam time - the time period when somebody could only send one message. Prevents from flood lovers. Optionally subscribe to receiving an email notification when the new PM arrives. Alerting forum message - as soon as a member has been posted specified number of useful forum messages, s/he's able to report other forum messages to administration by a click, that way helping in moderating forums content. Mass-mailing - forums admin is able to send one private message to all in seconds. Tested on hundred thousands of users and still works fast. PM plugin automatically inherits miniBB functions provided by the other add-ons like Smilies, Preview, Polls, File Bank. That means, a private message could have the same type content, as if you would post it on public forums. Read and ask more about the features of this plugin or its working principles, in our related forums topic. Watch it before you buy! This add-on is ready to blow your mind on our miniBB Demo Forums. Use temporary login details provided on the first page for two different accounts to check it out. 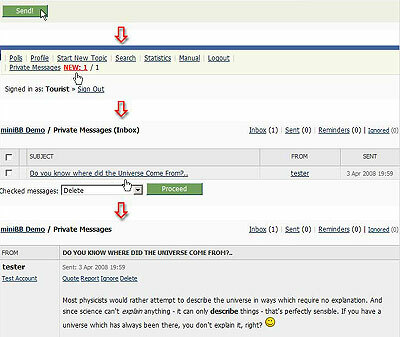 For example, login as a test user, locate the "Private Messages" link at the top forums menu. Enter this section and compose the message to the forums admin, entering "1" in the "Send message to" field. Logout, then sign in again as Admin. You will notice the new message's indicator at the forums top menu, and entering the PM section, will see a way to read the message. After buying this add-on, you will get a Lifetime license with the possibility to upgrade this extra for 10 times in the future, if miniBB.com releases the newest versions or patches. It doesn't mean only 10 downloads: you may skip a few releases, and download only something seems to be final. This is a unique offer, and it actually means, you pay once, but get something until it lasts. There are no hidden fees, no monthly fees, no annual fees. You get the editable source code and are allowed to modify any part of it. However you are not allowed to distribute your copy of the extra in any way, except using it for your own miniBB forums, or your own website. Avoiding distribution is in your very own interests; read more why. Click the link below and get this extra! Your order will make us happy to continue the free development of the cult forum software of all times, which miniBB is about. Thank you very much in advance for your support in advance. We have no donations page, no ads on the website, exactly because of such customers like You. Each of such purchase helps a lot to people, which get the basic program for free. This people will make your board even more stable in the future, because Free means Worldwide. You can't get a world for a buck. But you can get the world making your own world for a buck. Stay tuned! Upon your payment, please choose your local currency & save more! Besides U.S. Dollars, payment options are available in Euro, British Pounds, Australian Dollars, Canadian Dollars, New Zealand Dollars, Hong Kong Dollars, Swiss Francs, Danish Krones, Norwegian Krones, Swedish Kronas, South African Rands, Indian Rupees, Japanese Yens, Mexican Pesos, Brazilian Reals. Please note: for non-US currency, payment options may be limited to Visa & Master Card only. In advance, we thank you for your legal purchase and the successful business you make with miniBB®. Here, you will buy from our authorized retailer, 2checkout. Alternative payment methods are available, contact us privately for more information. Before you start, study the Delivery Policy of our products. After clicking the "Buy Now" link above, you will be redirected to 2checkout.com page. Please, verify your order and click on "Checkout" button, choosing your payment method, 2Checkout (Credit Card) or PayPal. If you choose 2Checkout, you will be asked to enter your personal and banking details. All major credit cards (incl. Visa, MasterCard, American Express...) are accepted. Choose your currency at the top part of the order page to save on your bank conversions (for non-US currency, payment options are limited to Visa & Master Card). If you choose PayPal, you will be authorized on its page and complete the purchase regular way like it happens on many other PayPal authorized stores. View screenshots showing the process of PayPal payment routine on 2CO. All your data is securely processed and stored on 2checkout.com side. After finishing the order, please return to miniBB.com page to complete the order. Each order is passing verification process, which usually takes from 24 to 72 hours (weekends are not included). Within this period, after it is passed by our retailer, you should receive the link to your customers download area. The letter is sent on the email address you provide upon the order. We are accepting all orders manually, and complete them on business days. Our Refund Policy in whole relates to our retailer's Refund Policy, and it is possible to issue a refund if you are eligible to clarify that your purchase was done by mistake or occasionally; in that case please contact us, or 2CO support immediately before the order is not passed the verification process. We are giving 100% warranty, that our software works as proposed, if installed properly and plugged-in with the latest supported version of miniBB; and the package files don't contain trojans, spyware or viruses. After we completed the sale granting the access to the protected downloads area, we keep all rights to not issue a refund. That's why we appreciate any of your questions, suggestions and comments before you purchase. If there is something specific about your order we should know about, please do not hesitate to contact us first. You can fully test online anything you buy and request additional information from us, if there is still something missing you would like to know about. If you ignore our statements, program descriptions, consultation service, the working principles of the software you ordered, or if you buy without knowing what your order is about, it can't be subject to refund the order. An automated system is used for completing the orders. That's why, in some rare cases, your email server may deny automatically-sent message. If you have made a successful purchase, but didn't receive the information about the your order within the 3 (three) business days, please check your bulk or spam folders first; if the email is not there - contact us privately, providing your order number. Order information will be re-verified by us and sent to you manually.